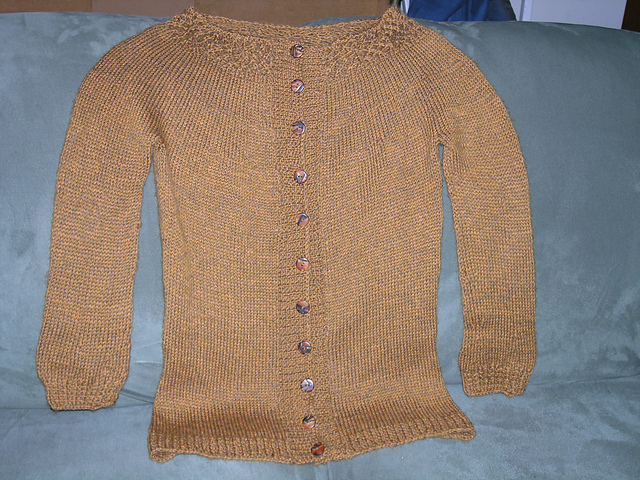 I’ve finished Mary’s Christmas Sweater!!!! It’s in the box and ready to be mailed — I just need to find a card worthy of it! Now I’m kind of floundering as I look for my next project… I LOVE this Kimono and have been imagining myself wearing it as I sit on the patio knitting or blogging or reading. I even bought the pattern. But, the recommended yarn is orphaned. The company – Mission Falls – went out of business and not all the colors are available. With all those colors to match, finding a new yarn is going to be a complicated (and probably expensive) project. And I really just want to get started knitting. I’ve been thinking about sweaters and really like the Oak Leaf sweater on the right. And I’ve found a couple of other patterns I like too. 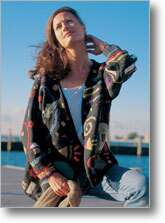 The online pattern store, Pattern Fish has a lot of patterns from the eighties when big-baggy sweaters were the rage. So I’m working my way through their collection and I’ll settle on something one of these days. In the meantime, I think I’ll use some yarn from my stash to make a shawl. Powerful political forces are seeking to silence working people—to drive us out of the national conversation. I can think of no greater proof of the moral decay in our public life than that Wisconsin Governor Scott Walker would dare give a Martin Luther King Day speech hailing Dr. King at the same time that he drafted a bill to take away collective bargaining rights from sanitation workers in Wisconsin. The ultimate goal of those who blame workers for Wall Street’s economic crisis is to unravel the fabric of our common life in pursuit of greed and power. In this environment, working people and our unions must do more than just protect our own right to a voice in the life of our nation. We must raise our voice to win a better future for all working families here in America and around the globe. Here’s what we are going to do. First, we are going to use that voice to end the Scott Walker agenda as a viable political strategy by winning recall elections in Wisconsin and citizen vetoes of destructive legislation in other states and retaking state houses. Then we will spend the summer holding elected leaders in Congress as well as the states accountable on one measure: Are they improving or degrading life for working families? And moving forward, we are looking hard at how we work in the nation’s political arena. We have listened hard, and what workers want is an independent labor movement that builds the power of working people—in the workplace and in political life. Working people want a labor movement strong enough to help return balance to our economy, fairness to our tax system, security to our families and moral and economic standing to our nation. Our role is not to build the power of a political party or a candidate. It is to improve the lives of working families and strengthen our country. It doesn’t matter if candidates and parties are controlling the wrecking ball or simply standing aside—the outcome is the same either way. If leaders aren’t blocking the wrecking ball and advancing working families’ interests, working people will not support them. This is where our focus will be—now, in 2012 and beyond. We will uphold the dignity of work and restore respect for working people. In this season’s political battles, teachers, nurses and firefighters have been vilified. Decent jobs with economic security have been cast as more than America’s workers deserve. Low-wage, part-time, temporary, no-benefit work is being sold as the “new normal” for our economy. We know that only a dynamic, effective movement of working people working together can reclaim the value of work. Our unions must reach out to every working person in America—to those whose jobs have been outsourced and down-sized, to carwash workers in Los Angeles, to domestic workers who have few legal rights, to freelancers and young people who have “gigs” rather than jobs. And together with the AFL-CIO’s construction and manufacturing workers, pilots and painters, plumbers and public employees, bakers and others, we will be heard. The stakes are so high, for working families, for America. Will we be a country ruled by greed, by people who would cut or take pensions away from first responders, people who would take away the fundamental human rights of our workers, who would choose tax breaks for the richest among us over a future for all of us? Or will we be a country where we choose the future, where we look out for each other, where all of us have a voice? Trumka got it. You can’t support people whose only interest in you is your canvassers at election time and your vote without expecting something in return. Democrats who unions as their cheap electoral labor take union support for granted and then quickly give in to the agenda of their party, which doesn’t include labor’s needs. It’s time to stop doing that. Most of the Mainstream coverage of Trumka’s speech sounds like he’s only blustering. This is what the unions always do before an election but when it comes time to actually go to the polls, they usually give in and help the Democrats. I’m not so sure about that this time. For one thing, the unions are engaged in some serious battles in Wisconsin, Ohio, Florida, NJ and other states. They’re probably wondering why they’re in such dire straits after they helped elect solid Democratic majorities in 2008. In retrospect, they gave too much of themselves and didn’t hold out for more. Secondly, the recent Canadian election should be a big red flag to the Democrats. Their Canadian counterparts, the Liberals, suffered a crushing defeat for capitulating too much to the Conservatives. The New Democratic Party, a party a lot more left and a lot less accomodating, raced passed the Liberals and are now in second place. The Conservatives won a majority government, but just barely. Now, Canada is ideologically split, the haves agains the have nots. And the bipartisan centrists are no where to be seen. They negotiated themselves into political oblivion. That must have been a shock to such an entrenched party. Critics might say it could never happen here but I wouldn’t be too sure about that. If Trumka decides to use the power of the unions and his un-unionized working class allies, he could start an independent labor movement and recruit movement candidates to primary challenge incumbents. The time is right. Even the well-educated researchers are tired of fearing layoffs, unemployment and low paying, insecure contract work while their less educated MBA brethren run around in their Lexus SUVs like the crash never happened. It’s pretty risky. But since neither party seems to want to help us, we have to help ourselves. If that means one party loses its power after 2012, well, maybe a couple of rebuilding years in isolation will help them readjust their priorities. Power is pretty potent stuff. Going Cold Turkey could be harsh. But at least labor won’t have the Democrats running interference any more. Labor can deal with the bastards directly and if Democrats want back in again, they can make a choice. The situation for labor is already pretty dire. It makes no sense to save some other party’s life if they aren’t going to do the same for you. It’s time, Richard Trumka. Where do we sign up?